The vacation of 2014 led us through Liechtenstein. I had done my homework and mailed model rail ag to learn that they welcomed visitors. When we finally found the small non-postsigned locality in a dead end street by a railway station, I was afraid they had gone home for the day. But they were still there; the manager was hospitable and welcomed us. When we left we had got a glimpse into a small company with an abundant 1:45 portfolio. I now see that I have more questions than when we arrived. A good sign. Disclaimer. I take no financial interest in this blog note; neither has model rail asked me to do this. It’s entirely my enthusiasm of the SBB Ae 3/6 II and the embodiment of this not-so-much seen model on the web that drives me. I was allowed to take pictures (press on them to see full pixel) and blog about it. 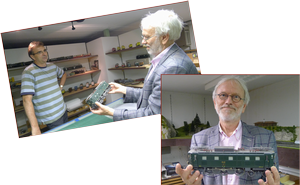 I already have a chapter about the loco (and all three versions of model rail’s SBB Ae 3/6 II) here – which also covers several manufacturers and scales. 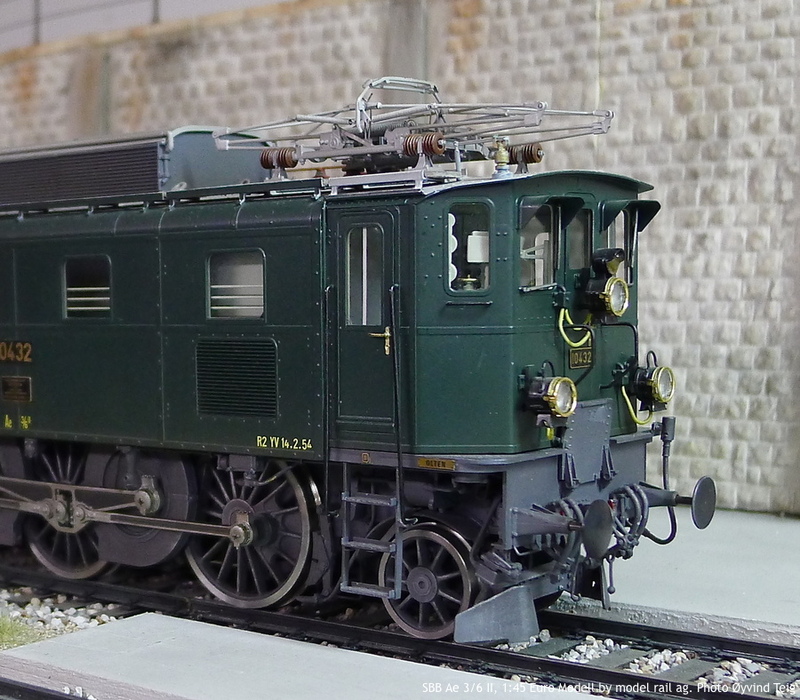 But a larger blog note about the SBB Ae 3/6 II is here (mostly 1:87 H0). We were invited down to their showroom in the basement. I immediately discovered an SBB Ae 3/6 II on one of the shelves. They were full of other goodies, which I regret I was impolite enough not to pay much attention to, not even a steam engine true to last detail. But I had in the mail told about my hang-up. The manager lifted the SBB Ae 3/6 II up so I could see it with my own eyes. More than that, I was allowed to hold it (above). It is 14.090 mm / 45 = 313 (or 304?) mm long and it is model rail’s article number 145 601 in their EURO MODELL product range. The SBB Ae 3/6 II is serial number 10432 and has revision text “R2 YV 14.2.54” (so it is time period ca. 1950 – 1970 as they say on their web page). 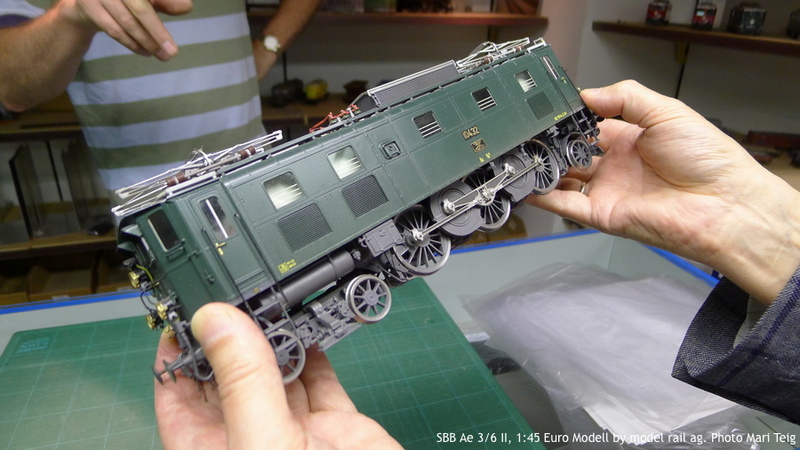 Update 16Jan2017: Model rail has an EURO-MODEL Info! Nr.2 from July 1997 about this loco here with heading “Wieder lieferbar, Ae 3/6 II in Spur 0”. There it says that the model weights 3100 gram. Above it sits on a display table (7.2015: I corrected as much camera distorsion as possible. OS X. Photoshop Elements 11. Downscaling to 900px in GraphicConverter; it’s especially difficult to find the right algorithm for the ventilation frames). The loco is built with sheets of brass, see their web page for a good explanation. Lost wax technique is used for details. And then of course all the machining that needs to be done for the other details. And painting and lettering. The gear is arranged so that it’s possible to push the loco by hand. Doing this I could hear and feel the moving parts running in harmony. 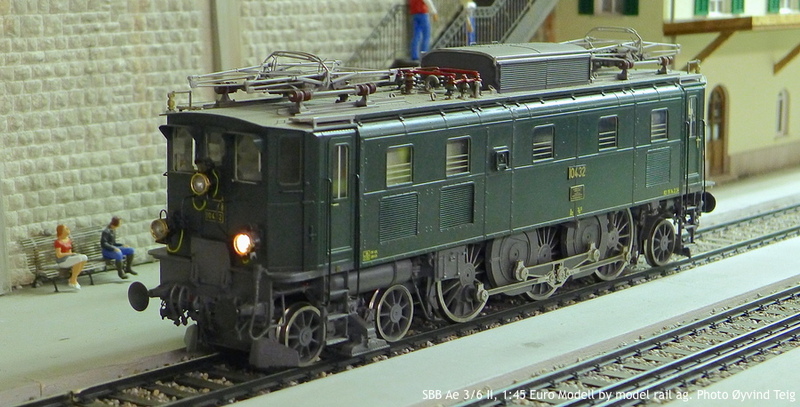 This is probably the only 1:45 O-gauge SBB Ae 3/6 II that will ever see. The fifty units that they manufactured around the turn of the millennium belong to others, and model rail has none in stock to sell (at the moment it looks the contrary on their home page). (Neither the manager nor I discovered that a handrail should have been repositioned for the picture). The manager ran the engine on their 1:45 scale demo layout. It ran beautifully over the DCC digital interface. Here you can see it move away from the camera, since only one lantern is on (above). The layout has 0-gauge (or O-gauge) (1435 mm normal track / 45 = 32 mm gauge) track – for the SBB Ae 3/6 II. But it also has narrow gauge, the 0m-gauge (1 meter narrow track / 45 = 22.2 mm) with running equipment from the Swiss Rhaetian Railway (Rhätische Bahn) (above, right). There also is a combined 0 and 0m line. I think that all you see except for the people and building are manufactured by model rail. It will be interesting to see whether model rail ag in the future will again make the SBB Ae 3/6 II or similar-looking engines. My grandfather worked with electrical generators and transformers when the Swiss engineers designed this machine. My father wound generators for hydro power stations in the thirties. I do know why I am so attracted to the SBB Ae 3/6 II: it has a creation history by itself, the design of the scale models intrigues me, and the final models are pieces of art. Combining this with rods has made this loco irresistible to me. By the way. The manager told me about an exhibition that they were going to participate in (in 2014, at least): Plattform der Kleinserie at www.kleinserie.ch. Update 7.2015: Model Rail ag has updated the pictures on its web page to better resolution: brown 10439 article no 145602 as of 1976 and green 10432 article no 145601 as of 1950-1970. The latter is of course this model. Both are priced at CHF 6050, but not in stock.